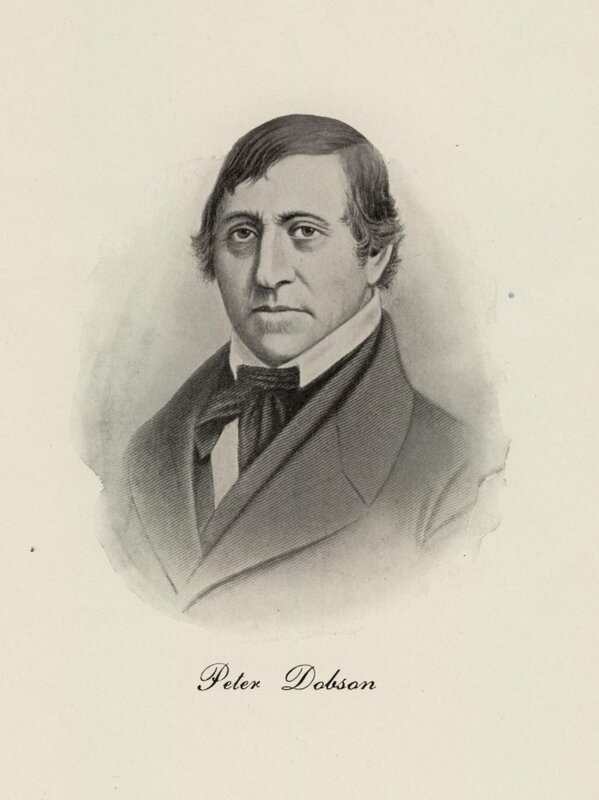 PETER DOBSON (1784-1878), for whom Dobsonville was named, in 1811 built the first cotton mill in Vernon with his partner Samuel Slater. It was located at Talcott Ravine on Dobson Road and around the mill were built the houses and community that thrived for over a hundred years. Peter came to Vernon from England about 1809 where he was skilled in making machines. At the time, England did not want the new country making their own cloth so Peter had to hide himself and his plans inside a barrel to leave the country. Once here he began work on the mill. Peter was a very good engineer designing his own machines to copy and create fancy weaves and light weight cloth. Over the years the mills grew with many modifications, expansions and partnerships. Peter's son JOHN STRONG DOBSON joined him in the work and continued it for a time when Peter retired. Peter is also known for being the first to put forth and have published in 1825 the idea that the many stones and markings we find around the area were carried or created by glaciers. He drew this conclusion while digging foundations for the mills. It was published in England, although largely ignored as Peter wasn't considered a scientist. But he was obviously very intelligent, clever and curious. The kind of person that built the country in our early days. For a full biography of Peter Dobson, Scott Lent has posted on his website an article on Peter from “Textile Industries of the United States”, written by William R. Bagnall, M.A., in 1893. Go to Peter Dobson biography.